Journalism's Battles Are On Display In Jill Abramson's 'Merchants Of Truth' The former New York Times editor's examination of four news outlets pits new against old, mercenary versus honorable — and is unlikely to inspire the next generation of journalists. "Everyone knows there is a good Jill and a bad Jill." In her new book, Merchants of Truth, Jill Abramson writes that this is what New York Times publisher Arthur Sulzberger Jr. said to her before he gave her the job of executive editor in 2011. Over the course of the book, it becomes clear what he means: In the good category are her tenacity and drive. In the bad are her ruthlessness and arrogance. It is possible that these are all words for the same thing. Whatever it is, it made her the first female executive editor of The New York Times, and it got her fired three years later. 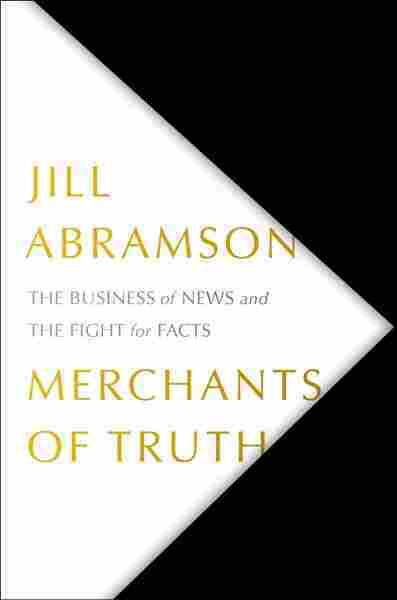 Merchants of Truth is an inside account of Abramson's time at the newspaper, her firing, and the state of the news industry in general. In it, both Jills are fully on display. She uses her book to mount an expert and passionate defense of old-school journalism. But she overlooks some of its core tenets to do it. Abramson models her book on David Halberstam's 1979 The Powers that Be, the examination of The Washington Post, the Los Angeles Times, CBS News, and Time Inc. that first inspired her to be a journalist. Abramson similarly uses four outlets to examine the state of current media: The Washington Post, The New York Times, Vice and BuzzFeed. The gossip is great, but Abramson also conducts deeply sourced and sensitive analysis of everything from the way that BuzzFeed exploits psychology to get clicks to the Times' ongoing struggle to maintain integrity and solvency at the same time. She also describes her firing and fraught relationship with her replacement, Dean Baquet. Abramson admits mistakes, including intentionally misleading Baquet about a hiring decision. But as the first and only woman in her role, she also suggests she was held to a different standard because of her gender: "I was seen as 'pushy,' " she writes, calling it "a familiar refrain about women in powerful jobs. In many studies, likeability and success are negatively correlated with women." Abramson is deeply concerned about journalistic integrity, especially the thinning line between business and editorial sides of news outlets. But, even so, she makes a surprising number of errors in her own work here. Many of these are quiet but revealing omissions of context. In a passage about the ethical danger of BuzzFeed's use of native advertising, Abramson includes a damning quote from BuzzFeed co-founder Jonah Peretti: "I enjoy working in morally ambiguous spaces." But the quote isn't from 2013, as she claims, nor is it about native advertising. It is from a 2006 interview in the Brooklyn magazine Stay Free!, and Peretti was talking about a completely different, pre-BuzzFeed project. At another point, she argues that the information overload of the Internet age makes Americans ultimately less informed. As evidence, she cites a 2007 Pew study that "found that the share of Americans who could name the vice president had dropped 5 percent from 1987." But the report also says that Americans are now slightly more able to answer questions about national politics. In other words, according to Pew, "On average, today's citizens are about as able to name their leaders, and are about as aware of major news events, as was the public nearly 20 years ago." These aren't howlers, but quiet compromises with the truth. The Peretti quote, in its proper context, could even be fairly used to help her argument. But instances like these show how her biases may be, at times, eclipsing her commitment to accuracy. "Most of the on-air talent was very young and had scant experience; only three had ever reported on camera before. What they had was 'the look.' They were diverse: just about every race and ethnicity and straight, gay, queer, and transgender. They were impossibly hip, with interesting hair." Not only is this framing dismissive and cruel, it also shows that she doesn't understand that diversity is one of the biggest advantages of Internet media. Young people do and should expect journalists to look like the people they write for. Abramson's snide tone also contrasts sharply with the way she writes about journalists who have a different "advantage" — family ties. "[T]he news was in his blood," she writes of one editor with an editor father. The book concludes with a hopeful line about the newest Sulzberger, a baby girl, who is held up, Simba-like, as the heir to the fight for truth: "This sixth-generation Sulzberger would be reared with the values necessary to be both a guardian and a merchant of truth." This dismissal of new and diverse talent in favor of the establishment makes it clear which group of people Abramson sees as her natural allies. In Merchants of Truth, Abramson seems to see the world in black and white: new versus old, mercenary versus honorable, clickbait versus reporting, advertising versus editorial, and so on. People are either allies or enemies. But as Abramson — good Jill and bad Jill — should know, it is rarely that simple.